What's "PixeBurn! for HD" ? 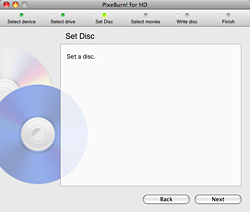 You can easily write a disc by connecting the camcorder and following the steps displayed in the screen. How to Use "PixeBurn! 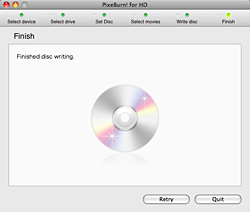 for HD"
When reading from a DVD or BD disc, connect another disc drive for writing, or save videos in the disc to your Mac® using Disk Utility. Check the movies to write. You can change the playback order by dragging and dropping the movies and also play back a movie by double-clicking. 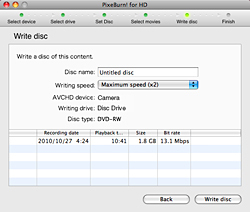 Enter disc name and select the writing speed. * For viewing PDF format data, Adobe® Reader®is required. *1 8cm discs are not supported. 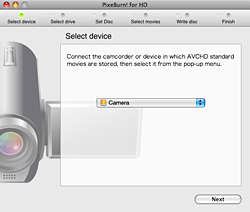 *2 If options are not displayed, check the connection of the camcorder or the device. *3 You cannot read from two or more devices. *4 If using an external disc drive and the option is not displayed, check the connection between the drive and Mac®. * Screen captures in this document are from the software under development.